Very interesting. This actually makes me sad. I would hope that drawn features would come back, but I guess we're going to only see those coming from the independents, if at all. Your comment about CG films becoming popular due to being more in synch with people's real-world perceptions is especially interesting to me. I was having a discussion on facebook about whether drawn animation is a suitable medium for adapting classic literature, such as Dickens, Cervantes, or Conrad. Will an audience accept a purely animated version of these works, or would the filmmakers have to be more literal in their animation? That's for the in depth look at this film. I hope to see this film as it looks beautifully crafted. There is one aspect of this film that has me scratching my head. Was this new film actually silent (with the exception of the one song with lyrics)? No sound at all? It is my understanding that most 'silent' films were almost always be accompanied by live music. As early as 1895 they were said to have a pianist accompaniment and later an orchestras sat in the pit and tried their best to stay in sync. If there is accompanying music that attempts to replicate that live music then this effort makes more sense from a technical and historical perspective. Barring that it seems we are being asked to return to an age that never existed in the first place. Of course, having not seen the films in question (present or hisotrical), this is all conjecture. The film has a music track. I find your theory interesting but I wonder how stop motion figures in. It is certainly more like the "real world" in terms of depth, texture, lighting and dimensionally, so why not a stop motion boom before the cg boom? Why didn't Nightmare before Christmas and James and the Giant Peach or Corpse Bride do better? The technique was there, it's dimensional, it feels more real than cg, why did those films not create a stop motion boom? I haven't seen "The Artist" as yet, although it's top of my list to see. (Actually, it's about the ONLY film that I'm planning to see these days, sad to say). I have to quibble with you on one thing, though. There's no question that it is an "affectation", as you describe, but I'd argue that it was never meant to be anything more than that. It is undoubtedly meant as a loving homage to those simpler times of the silent films, but it is a one-shot novelty, not in any way hoping to bring about a return of the silent, black and white film as a form of popular entertainment. I think that's quite obvious from the fact that it's set in the 1920s, not using the format to tell a contemporary story. Back in 1976, Mel Brooks gave us "Silent Movie", which was also a love letter to silent films, though one set deliberately in modern day in order to parody it in the Mel Brooks style of absurdity. But that film too was never intended to usher in a new wave of silent pictures. Animation may have started out as a novelty on screen, but once Disney and Fleischer popularized the illusion of moving cartoon drawings as a legitimate form of entertainment, it was recognized as a distinct art form in itself, a completely different experience to that of a live-action film. Even the technological advances in features like "Pinocchio", "Fantasia" and especially "Bambi", did not so much blur the line between drawing and live-action, but rather, treated the resulting imagery more like moving paintings, still far removed from live-action cinematography in their graphic visual clarity. I guess someone will have to find a place for classic drawn animation to thrive away from audiences that need the relevance to their experience and perception of the world. I don't, for a second, believe it's the audience that is rejecting hand drawn animated films in favor of cgi. It was Eisner and Katzenberg that tolled the death knell for cgi at their studios not the audiences. The people just wanted better films than Sindbad and Treasure Planet or Spirit and Atlantis. Crowds flocked to Toy Story because it was a good movie, not because it was cgi. Ads for the re-release of Beauty and the Beast have just started airing in NYC. No doubt they'll duplicate the enormous success they had in the re-release of Lion King. They may now be in 3D, but they're still hand-drawn success stories. They're also good movies. I love silent movies, I love black and white. It takes a lot of courage to go out and make a movie or even a short film that doesn't follow the trends. Hope we get it here in Australia. Aaron, I don't know why the stop motion features you mention didn't spark a boom. However, I do find it interesting that stop motion hasn't suffered the same decline as drawn animation in North America. It could be that the resemblance between stop motion and cgi is close enough that audiences are satisfied the same way with both. Peter and Michael, I expected to get resistance on this post and you both know how much I love drawn animation. My concern is that we're inside a bubble talking to ourselves. The people who visit our respective blogs are all fans of drawing and drawn animation, so are our opinions representative of the general audience? The preference for realism by the public is well-established, I think. When the abstract expressionists were all the rage with critics, Norman Rockwell was probably more favoured by the average person. Realism is familiar and so it is comforting. Less realistic art requires a more educated eye. The one exception to this is in the area of humor. A lack of realism is automatically accepted when the goal is to get a laugh. The lack of an educated eye in this area is why so many of the prime time animated series are so brutally ugly. The audience isn't revolted by the poor art and animation in them as "funny looking" equals "funny" even though to us, the same "funny looking" equals ugly. I'd point out to anybody that's read this far that Peter Emslie has reprinted his comments on his own blog and will accumulate other comments there. Plus, Keith Lango takes off from this post and wonders if the urge for realism will doom animators of all types in favour of motion capture. Things are changing, often in ways we don't like. I'm not endorsing cgi over drawn (and certainly not mocap over keyframing), but I am trying to figure out why the audience is buying what it's buying. Except for students, everyone else has to take that into account if they want to stay in business. Excellent post. I think the missing part of the discussion is, assuming one agrees with you, is "what do I do with this information?" I agree that if one wants to survive in this business they should understand what is selling, but at the same time that concern is more for an executive, not an artist. As animation industry people, the craft side to our livelihood benefits from such examination, but the artist side (the work we do on our own for ourselves) should create freely without concerns for what the market "wants." Otherwise the executives and the artists are arm-in-arm building an industry of junk product. This is an interesting post because I've had the sinking feeling for awhile now that audiences have grown to prefer CG over traditional animation. Now, they don't hate 2D (take a look at "The Lion King" re-release's box office), but I think they see it as old-fashioned. CG is new and tech-heavy and it fits in with our increasingly tech-heavy society. Here's an experiment: can you a name a successful 2D film that wasn't produced by Disney Animation. Kinda difficult, right? Now, can you name a successful CG film that wasn't produced by Disney? That's a little easier. Audiences have responded to CG within the past two decades far more than they have with 2D. With "Toy Story" people got to see something new and that's what they want now. Mark, one major aspect that escapes both you and Keith in your musings on 2D vs CG and the OLD analogue vs NEW technology is the simple fact that people still draw. Very much so. The strength of 2D animation is that it is anchored to one of the fundamental roots of art and the process of creating beyond any one animation medium. The technology will grow and evolve, for sure, but I believe it will come full circle. With the expansion of touch screens, virtual manipulation and new human interface and input technologies, the traditional processes will be brought directly into the digital production even more so than now. And there will be more folks using it and a broader range of things that we can do with it as well. I only hope that the production software becomes simpler, more intuitive and less convoluted as soon as possible, tracking back to the more archaic interfaces most humans are accustom to. Those with less buttons and more actions and physical doing. So why does CG3D and Mo-Cap seem like the be all and end all at the moment for big feature productions? Here’s one sliver of a perspective; 2D Anim, the simple traditional pipeline employed, lets say a few 100, vs 3DCG Anim, the newer and more intricate tech pipeline that now employs lets say a good 1000 or so with many more roles and tiers in the production. A bigger hive with more specialist worker bees. Mocap is that hive minus the few 100 or so specializing in one part of the production, sadly in KeyFrame Animation. To $THEM$, for all intents and purposes, it’s the same “Bigger” & “Better Looking” package minus a few grunts. So tell me, with the biggest animation industry at the moment (in terms of volume) arguably being the Animation Education Industry, what do you think all these kids will do if your prediction of the future arrives with no changes to the current direction or model, or alternative perceptions and content in the mainstream feature industry? Will they simply help produce more TV Animation? More TVCs? More I-phone/Product Apps & Games? More? Internet?? Pffffft!! There will be animated feature films made in a greater array of ways in the future as there have ever been made in the past. Most likely from the same monolyths of the industry such as Disney Feature Animation and so on. The Audiences herd mentality is defined by what is currently out in the market, and what’s currently in the market is Spielberg, Lucas, Jackson, Cameron, Weta, etc. All simultaneously directors and men with $means$ to make their merchandise. But the terrain will roll & change and… surprise surprise… so will the audiences taste. Will they have become more enlightened as a collective? Not really. But if you build “the barn”, it’ll draw its crowd. So what do you need to build “the big barns” of feature animation? Big money wells the likes of Steve Jobs, Philip H. Knigh & Disney Corp™ of course. Perhaps in the future age of the internet we’ll even see the first crowd funded feature film production, animation or otherwise. ... But I’m getting off topic. So, to summarise; People still Draw (with ink & lead). Technology & software improves to suit its users needs and desires. And you still need substantial $Dough$ to put on a substation (feature sized) *Show* or to build a feature studio. The thing is, I'm pretty sure just about any filmmaker since day one would have opted to use sound if given the choice. Fewer than that would choose color over black-and-white. I'm doubtful Walt would go for the Jackson-Speilberg look if given the chance in his time. I'm with Mike Sporn. In the beginning, Pixar was simply giving audiences quality with their earliest stuff that just wasn't seen in the hand-drawn features. Disney hadn't had a hit since The Lion King, and people just wanted something good, and that came with Toy Story, and that's where their cash started going. The proof is the popularity of the rereleases of the Katzenberg era features. CG may have rubbed out hand-drawn in the theaters, but as the press is constantly telling us, the theater experience is dead anyway, so who cares. The majority of animation seen on television, direct-to-video, and online is hand-drawn, and it will remain so. Thad is "pretty sure just about any filmmaker since day one would have opted to use sound if given the choice", but I'm not entirely sure this is so. I've read accounts of 20s filmmaking that suggest that many filmmakers resented the coming of sound because it spoiled the 'artform' that they had been creating - a very stylised form of communication: a vocabulary of looks and gestures that they saw as visual poetry. The 'realism' of sound would sweep all that away, and it is a similar fear that Mark is voicing - the possible loss of a particular style of moviemaking as technology supercedes it. What the coming of sound actually did (which smaller, non-American studios were most troubled by) was limit the international market for cinema. Silent films (requiring, at most, translated intertitles to be cut in) were totally accessible to global audiences, whereas sound films needed either expensive redubbing or subtitles added, and in either case audiences were aware that they were watching a 'foreign' film. Markets shrank, filmmaking became relatively more expensive, and small companies closed down. Now the very platforms for film are in flux. I think 2D animation will continue to be created, but it may be a while before it can win the attention of the money men, and be granted big budgets. Perhaps limited funds may be a good thing, as big budgets lead to too much scrutiny and interference, and a resultant timidity in production decisions. IMHO. Very thought provoking and challenging post here , Mark. I'm still digesting it. My default position of course inside my hand-drawn "bubble" is to more or less agree with Pete Emslie's and Michael Sporn's comments. I also found Aaron's commens about Stop Motion interesting. I think the average movie-goer would not be able to tell you if Nightmare Before Christmas, The Corpse Bride, Coraline, or the forthcoming ParaNorman was made in CG or was "hand-crafted". So why haven't those stop-motion features been more successful if what the audience is looking for is that kind of 3D realism ? I think it's that audiences are not necessarily just looking for the the 3D realism. It's something else. I liked Coraline a lot , but I recognize that it was basically an "art house" film appealing to a certain type of film fan who appreciates "quirky" films over mainstream films (I'd include Henry Selick's other films , James and the Giant Peach and Nightmare Before Christmas in that "quirky" art-house film category , along with The Corpse Bride). I think the Aardman stop-motion movies , Chicken Run and Wallace & Gromit in Curse of the Were-Rabbit were more commercially successful , through both of those movies were less realistic, more "cartoony". Although there have not been any stop-motion mega-hits on the level of a hand-drawn movie like "The Lion King" or a CG movie like "Finding Nemo" , it does seem as if the stop-motion animation community (which is even smaller and more tight-knit than the hand-drawn animation community) doesn't seem to have the same defeated/defensive attitude as many hand-drawn animators. (and I'm including myself in that) If anything should have died out in the face of the CG tidal wave it should have been Stop-Motion, right? But it didn't die . The stop-motion practioners just keep chugging along , making their films in their chosen medium, apparently without the angst and hand-wringing that afflicts us aficionados of drawn animation. The other thing that puzzles me about the apparent rejection of hand-drawn animation is that as "The Optimistic Pessimist" points out : people still DRAW. A lot. Drawing per se is not unpopular and it's neither "old fashioned" or "modern". There are different styles of drawing , some more modern, some classical, some that are definitely "retro" or "old-fashioned", but drawing as such isn't something that is out of style or something that people don't respond to. Any of us artists who have ever had the experience of opening up a sketchbook and drawing in front of people in a public place will know that non-artists tend to get very excited to see someone drawing. They are AMAZED by it , almost always manifesting an "Oh, WOW , how do you do that? That's so cool!" sort of attitude when they see someone drawing. And there's the continuing popularity of drawn comics. Comics are a niche market certainly, but many fans respond specifically to a certain artist's style of drawing, even with old well established characters like Batman or Spiderman. The actual drawings make a difference. And yet those older, established characters in particular could simply be replicated as CG models in an "asset library" , posed out by a comic book editor with no pencilers or inkers involved , rendered in a flat "toon-shading" style that looks to the average person like classical cartooning on the surface . But why hasn't the value placed on drawing diminised in comics like it apparently has for hand-drawn animation? I don't think it's because people don't respond well to drawings. There's something else at play here, I just can't quite put my finger on it yet. No answers, I'm just thinking out loud ... sorry for the rambling post. 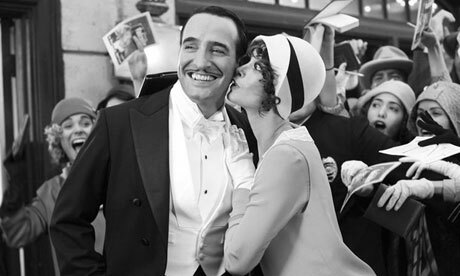 By the way, I LOVED "The Artist" (no surprise there, eh ?) . And of course, even before I read your blog post I was thinking about the parallels between the apparent death hand-drawn animation and what happened to the silent films. "I think your analogy to hand drawn animated films may ring a bit false here, Mark, with due respect. Whereas nobody would want to bring back the silent film as an ongoing form of popular entertainment, recognizing its inherent limitations that no longer exist since the advent of sound and colour, those of us who champion drawn animation still believe it will always be a valid form of the art." B & W sound film on occasion, when the material being presented makes it appropriate. (and how about colour/sound non-talking movies, like the first 30 minutes of Wall-E or the mostly non-talking sequence at the start of UP ? A whole movie could be made like that.) The feeling I get watching a film like "The Artist" is different from how I feel watching a whizz-bang popcorn movie like "Mission Impossible: Ghost Protocol" but I wouldn't say that a silent B & W film like The Artist is inherently any more "artificial" an experience than Ghost Protocol just because The Artist doesn't use dialogue, colour, and modern cinematography techniques. I feel the same way about different forms of animation: it's all good. I'd like to have the choice to see a regular number of hand-drawn, stop-motion, or CG animated films. Of course, I realize that I'm probably just talking inside the bubble to fellow true believers when I say that . A fascinating discussion. I've enjoyed it very much. As an old guy who sat in meetings with Walt, I wonder what the old man would have to say about all this? Interesting post and discussion. There was a time when the stylizations of UPA and others were widely accepted in commercials and cartoons. The greater abstraction of this style pushed wit to the foreground and also explored the use of pure colour. Sound and music were often abstract and witty too, at Warner's as well as at UPA. Fashions change and I confess nostalgia for the "cartoon modern" period. But I hope that audiences will still respond to strong work. Norman Rockwell didn't bury the moderns. But if it's true that audiences will increasingly demand "realism", whatever that means, it's a sign of the decay of imagination. While there may be a case for arguing that audiences are attracted to "realism", I think the issue may be more about expectations. I fear that 2D has become equated in the popular mind with old-school Disney, and, by dilution through the quantity of derivative sat-AM TV animation, seen as old hat. A type of movie that, having seen once, you never need to see again, because you know it already. It may once have been magic but now it's just disappointing. In other words, in the mind of the audience it has peaked, and ossified. Whereas CGI is still searching for a form, and despite the formulaic storylines and performances there is still something fresh turning up amongst the dross - enough to both amuse audiences and to provide a sense of novelty. In short, despite CGI rehashing all the formulaic devices of 2D animation, I think audiences are over-familiar with 2D, and think it passé. So I think 2D will remain in the doldrums until someone comes up with a fresh approach, ditching traditional tropes (sentimental songs, cute characters, stock responses, etc) and taking inspiration from some completely different sources. And, of course, it would have to be entertaining. I can't see anyone putting money into such a project, so it would have to evolve from small independent animators. "Pretty sure" could easily turn into "pretty wrong", yes, but the holdouts who would keep movies silent in the name of art (which I accounted for originally anyway), were not a majority, and the paradigm of silent to sound/black-and-white to color is completely different from the gravitation from hand-drawn to CGI. Most audiences actively wanted those changes. I've never heard of mass audiences actually clamoring for CGI over hand-drawn. A really interesting post. If I may make a simple point that I think may have been missed: Why are there still animated films if the audiences are wanting realism? Why not just stick with live action? The reason that animation's realism is different from live action's is that there are things that live action can't show very well but animation can. There's a multitude of things that animation can show inside a living person's body that live action couldn't for ethical reasons and there's no bulldogs that look like the way they were, I believe, in the early 1800's. There may be only a partial use of animation for the things that need to be changed, but for a more extreme case, like a setting on Mars where everything has a different gravity, it probably has to be animated. There's all sorts of distinctions like that. Though motion capture stifles many of the distinctions and I think it ought to be obsoleted, for most cases, in favor of a more fully animated approach that doesn't have the vestiges of live action. I need to reiterate that it's still not as convincing as live action and I don't know how good it will get in the future. Nevertheless, this won't keep it from being useful within its current limits. In the beginning, Pixar was simply giving audiences quality with their earliest stuff that just wasn't seen in the hand-drawn features. Disney hadn't had a hit since The Lion King, and people just wanted something good, and that came with Toy Story, and that's where their cash started going. This is both true and false: The fact is, if Toy Story had been done in 2D, it probably would NOT have been the smashing success that it was. It would still have been a good film, and have had the charm and sweetness and sass it did, but really, what made it a megahit was that AND the technique, giving the story a wow factor and novelty that brought people in to see something different-LOOKING. That coupled with a nice, strong story with humor was what put it over the top. Pixar played pointedly to their strengths and compensated for the weaknesses of CG of that time by gearing the entire thing to characters that would look good when reading as "stiff" or hard and plastic. Some fantastic people giving a fantastic, but apparently “dying”, form of visual & literary entertainment their efforts. At any rate I recognise my own clear bias and think there have been good points raised & conceded on both sides of the proverbial discussion fence in this thread, and I for one would love to hear further comments from you, Keith or others. An Encore to this debate if you will. A film like the Artist can be not only a good reflexion about the animation how it grows technically but also to the motion picture itself. Many producers seems much interested to the CGI techniques than for the talents of actors or a good story. If a story is stiff, if actors plays bad, CGI effects can't even saved. We can think to the Transformers pictures by example or the last year's Razzie winner Last Airbender. Such moneys wasted for not something. "I learnt everything from Andy Serkis"
Well… this process doesn’t seem hilariously convoluted at all. I guess with all those digital stage crew running about it makes Steven feel like he’s on a proper set. fascinating!